Just after sunrise, the icy hoar frost clinging to the willow branches in the Tanana River Valley begins to shudder. At first, the wind comes in a light zephyr. Branches lazily sway; a few ice crystals lose hold and fall from their perch, catching the rosy dawn light, making the morning air sparkle. Within an hour’s time, a powerful gale is blowing. The air fills with fine, crystalline powder and snowdrifts form on the leeward side of every bump and rise. The wind will not stop for weeks. All the critters in the valley will forget that there was ever a time when the world didn’t scream and hurt. No small task. But for someone with 4 standard deviations above the normal IQ and an active member of several international high IQ organizations, for Kerry, this is just another day in the life; another challenge to be met. 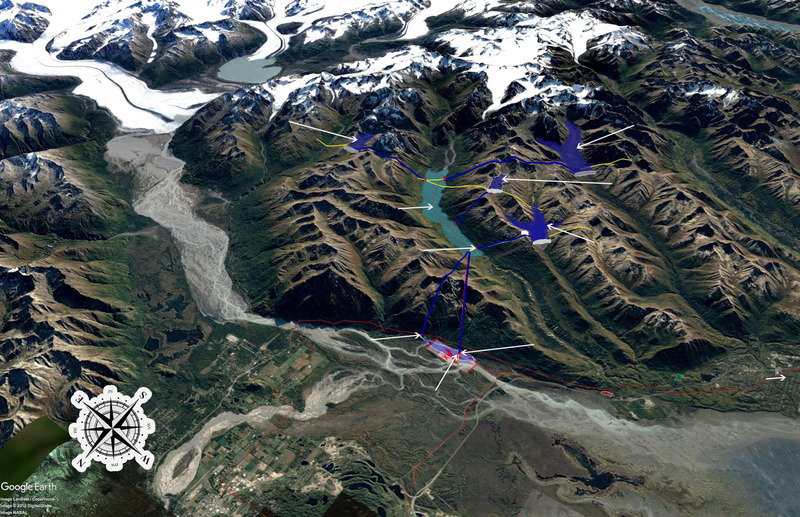 “My proposed Eklutna Complex is nothing more than a gigantic rechargeable battery." The next thing to focus our most talented engineering minds on is the study of Kerry’s proposed high elevation impounds, e.g. dams, above Eklutna Lake and then building them. Kerry has identified five ideal, high elevation valleys, which are perfect locations for enough high altitude water energy storage to light, heat, and drive the entire rail-belt for months. By pumping water up to these reservoirs, through tunnels in the mountains, when there is surplus energy, this project would be an energy savings account—a literal rainy day fund. In 2009, then Governor, Sarah Palin, understood the threat climate change was having on our state. Alaska is warming twice as fast of the rest of the nation and four times faster in winter because our civilization produces an additional 40 billion tons of greenhouse gases every year. This increase in greenhouse gases is also disproportionately acidifying our seas. Roughly 30% of those greenhouse gases come from our global energy demands—coal, oil and natural gas power plants. Governor Palin set a mandate that Alaska would, by 2025, provide half of its energy needs from renewables. If we get to work, Kerry’s plan could shatter this goal. What would rate payers pay per kilowatt-hour, I asked him? Without flinching, he has an answer and I realize, again, I am in the presence of someone way, way smarter than me. “After we’re at 100%” he has calculated, “and have paid off the bonds, it should drop to around $0.08 kWh, except for homeowners and businesses who cover their roofs with solar panels. They would pay considerably less, or even profit if they generate more than they use.” Right now, MEA customers pay about $0.20 kWh, and Golden Valley members pay $0.21. “I’ve already talked with a few of the stakeholders whom I would expect to have the most relevant expertise and pointed criticisms, and so far they’ve been encouraging,” he tells me. “Rick Sinnot, whose study and article about Eklutna Salmon was the trigger; Marc Lamoreaux, Eklutna Village environmental director; Debra Lnne, Tanana Chief Conference natural resources director—about their potential wind resources to ‘charge’ the Eklutna Complex—and her Tanana Chiefs Conference colleague who owns a lease on the potential lease site; also, Ed Zapel, Senior Hydraulic Engineer for HDR, who understood my project instantly. They all seemed quite interested. I still need to talk with AEA personnel and CIRI wind personnel,” he tells me. Kerry William’s pumped hydro project is ready to leave the nest. It needs peer review, further study and will need the approval of the legislature and financial backing to bring it to the next stage. If you, or someone you know, has expertise, please contact us. Also, if you are a media outlet wishing to run a story about Kerry and or his project, submit inquiries here. Are you media wishing to contact Kerry about his project? Do you have expertise you'd like to contribute to this project? Are you a citizen with questions or concerns? Do you work in politics and would like to help move the project into the public sphere?